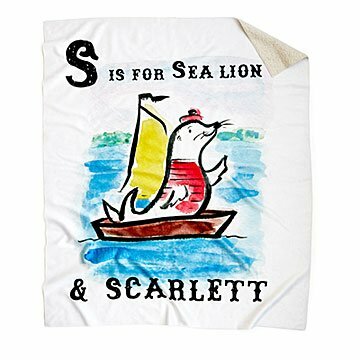 Let your little one snuggle up to this vibrant custom blanket, featuring their name and an enigmatic animal. N is for narwhal...and Noah. Little ones do more than get acquainted with letters with this vibrant custom blanket, they engage with charming characters that capture the imagination. Personalized with your child's name and an animal they share a letter with, this keepsake-ready design is a work of vibrant art they can cuddle up to. Whether it's a skateboarding hedgehog or sundae-sipping inchworm, Patricia Carlin's bright and cheerful watercolor illustrations give your child's animal a sweet personality. The soft poly fleece keeps them cozy, while the 50" x 60" size lets them wrap themselves up with their favorite animal friend long after they've learned their ABCs. Blanket made in China and printed in Colorado. Click here to see all 26 versions of the Personalized My Alphabet Letter Blanket. Wash on cold gentle cycle, tumble dry low. My Favorite Newborn Baby Gift To Give! This is my favorite gift to give a newborn baby. I don't love some of the animals/designs associated with certain letters, but most are very cute. I don't want to recommend this to any friends because I don't want them to steal my go-to gift idea!